5.1.2 It can be seen from the table above that successive Pay Commissions have consciously tried to reduce the number of pay scales even though they tended to increase during the intervening period between any two Pay Commissions. There were, however, no significant changes in the pay structure per se until the IV CPC, when the concept of running pay scales was introduced in a limited way in respect of Defence forces. For others, individual pay scales continued till the V CPC. It was the VI CPC which recommended running pay bands for both Civilians as well as Defence forces. This was coupled with the introduction of the concept of Grade Pay as a level differentiator. 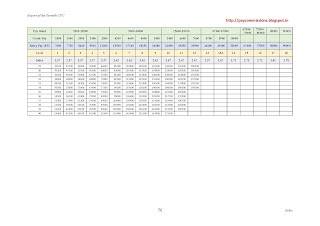 Another new feature was the calculation of the annual increment on percentage basis. Prior to VI CPC, the increment was a flat sum, depending on the pay scale. The effort at compression of levels was carried forward by the VI CPC, which reduced the existing 35 levels to 19. Another radical measure was the doing away with ‘Group D’as a category and placement of ‘Group-D’ personnel in ‘Group-C’ after appropriate training whenever necessary. Hence, it can be seen that the simplification process set in motion by previous Pay Commissions acted as a precursor for progressive rationalisation by the subsequent Commissions. 5.1.5 The Commission has endeavored to incorporate the above principles while devising the new pay structure. The approach of the Commission has been to ensure that the emolument structure is in consonance with the nature of work, role and responsibilities and accountability involved at various levels of the hierarchy in the Government of India. The value that individual employees are expected to bring to the job, by way of relevant educational qualifications, skill sets and experience are also important considerations. Internal equity, by way of salaries payable at comparable levels within the organization, are also important considerations. 5.1.6 The new paradigm of running pay bands was brought in by the VI CPC primarily to address the problem of stagnation faced in the earlier regime. Until then the limited span of individual pay scales resulted in employees reaching the maximum of the scale and stagnating until their next regular promotion. To alleviate the situation, often new posts were created even when no functional justification existed. This led to proliferation of levels and unwarranted increase in financial liability. Frequent movement from one scale to another also led to problems in pay fixation of seniors who, in some cases, ended up drawing lesser pay than their juniors. 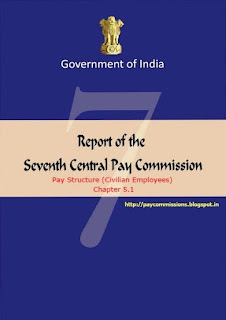 5.1.7 At the time of constitution of the VI CPC there were about 35 standard pay scales in existence. Many of these pre revised scales were merged by the VI CPC to arrive at 19 grades spread across four distinct Pay bands along with 4 distinct scales including one Apex scale (fixed) for Secretary/equivalent and one scale for Cabinet Secretary/equivalent (fixed). The concept of Grade pay was intended as a fitment benefit but it also served as a level determiner within a pay band. * For the Defence Forces the structure is identical, with only minor variations with regard to certain grade pay levels. 5.1.9 The pay structure as it stands today is fairly compact and manageable. 5.1.10 As has been mentioned earlier the VI CPC introduced several new features in the overall structure for determination of pay and allowances. In the course of implementation, while according approvals, the government, in some cases, departed from the recommendations of the Pay Commission. 5.1.11 Since the concept of running pay bands coupled with grade pays was novel, this Commission, at the outset, sought feedback from all stakeholders regarding the existing pay structure before deciding whether to continue with the existing pay structure or to devise a new pay model. a. Grade pay: As mentioned earlier, the grade pay was in the nature of a fitment benefit and was computed at 40 percent of the maximum of pre-revised pay scale. This was also meant to delineate the hierarchy in any cadre. The issue raised by various groups of employees is that the methodology that was adopted in arriving at the grade pay values resulted in the difference in grade pay between adjacent levels not being uniform. This in itself has caused resentment particularly at the lower levels. The quantum of difference between successive grade pays varies within pay bands too. For example in Pay Band-1, the difference between successive Grade pays is ₹400 between GP 2000 and GP 2400 and only ₹100 between GP 1800 and GP 1900. A large number of stakeholders have represented that the benefit accruing from progression either through MACP or from regular promotion was miniscule, especially in Pay Bands 1 and 2. As per the rules on pay fixation a promotion or financial upgrade by way of MACP fetches one increment plus the difference of grade pay and a low differential in grade pay presently results in only a nominal increase in pay. Consequently, there have been numerous demands for rationalisation of the grade pay structure. b. Pay bands: Employees have pointed out that while moving from one pay band to another the difference between successive pay bands is also not uniform and the variation is much more remarkable between Pay bands 3 and 4. This has led to significant difference in benefits accruing on account of fixation of pay (and of pension) for persons in adjacent pay bands. As a result, there have been demands from some quarters for going back to the system of individual pay scales and from some other to move towards an open ended pay structure. 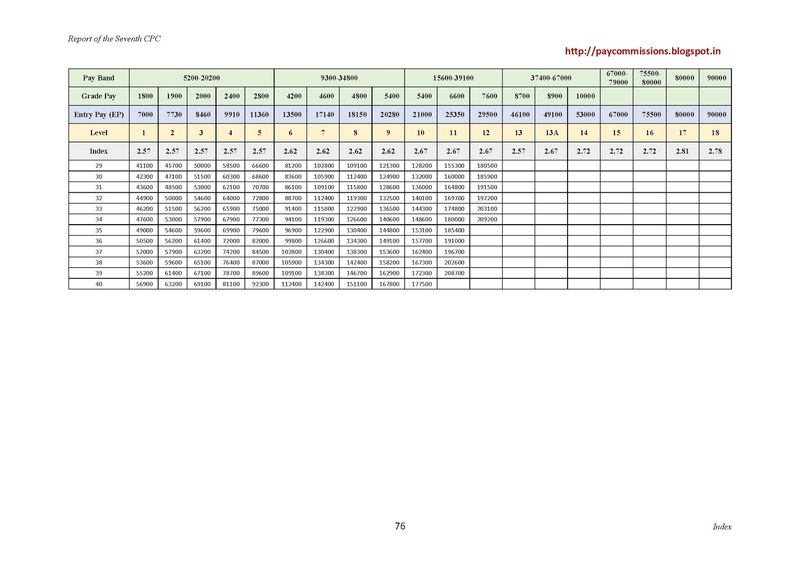 c. Uniform Fitment factor: The fitment recommended by the VI CPC was in the form of grade pay. Any inconsistency in the computation of grade pay or in the spacing between pay bands has a direct bearing on the quantum of fitment benefit. Therefore, these issues have also been raised by numerous stakeholders. It has been demanded by a majority of the stakeholders that there should be a single fitment factor which should be uniformly applied for all employees. d. Entry Pay: Entry to any pay band could either be through an upward movement from a lower pay band or through direct entry. While the pay of persons moving from a lower pay band to a higher one on promotion would be regulated by the pay fixation formulation prescribed (pay was fixed at the minimum of the pay band plus grade pay), the VI CPC had recommended a separate entry pay for new recruits, taking into account the length of qualifying service prescribed by Department of Personnel and Training (DoPT) for movement from the first grade in the pay band to the grade in which recruitment was being made. The resultant formulation was such that it led to many situations where direct recruits drew higher pay as compared to personnel who reached that stage through promotion. Demands have been received from many staff associations and employees for removal of this disparity. e. MACP: In almost all the memoranda received in the Commission, the inadequacy of the benefit accruing from the present MACP formulation has been underscored. As per the existing dispensation, upward movement in this scheme is through the grade pay hierarchy and the financial benefit as a result of this progression is equivalent to one increment plus the difference in grade pay between the existing and next level. It has been stated by employees that this amount is very meagre especially when the difference in grade pay is as low as ₹100. Further, progression through the MACP scheme can take place only when ten years have lapsed after the previous promotion/MACP upgrade, making the position even starker. Comparisons are also made of the MACP introduced post VI CPC with the ACP scheme introduced post V CPC. In the case of earlier ACP scheme, although it was available with lesser frequency i.e., after the passage of 12 and 24 years of service, the upgrade that was given was in the promotional hierarchy. Therefore the monetary benefit to the employee was sizeable as compared to that under the present MACP. Numerous demands have therefore been received in the Commission to rationalize the progression of grade pay, to increase the frequency of administering MACP and to make the progression follow the promotional instead of the grade pay hierarchy. 5.1.13 Although the VI CPC had mentioned that grade pay would be equivalent to 40 percent of the maximum of the pre-revised scale and that the grade pay will constitute the actual fitment, yet the computation varied greatly. After the implementation of recommendations, the difference became more pronounced in Pay Band 4 as compared to the other three pay bands. This resulted in varying fitment factors for various levels and promotional benefits that were perceived to be rather differentiated. The same pattern was discernible in the pension fixation too. 5.1.14 After analysing the issues brought out by various stakeholders, this Commission is suggesting a new pay model that is expected to not only address the existing problems but will also establish a rationalised system which is transparent and simple to use. 5.1.15 To begin with, the system of Pay Bands and Grade Pay has been dispensed with and the new functional levels being proposed have been arrived at by merging the grade pay with the pay in the pay band. All of the existing levels have been subsumed in the new structure; no new level has been introduced nor has any existing level been dispensed with. 5.1.16 The pay structures in vogue, by way of pay scales or pay bands, indicate the definite boundaries within which the pay of an individual could lie. It is however difficult to ascertain the exact pay of an individual at any given point of time. Further, the way the pay progression would fan out over a period of time was also not evident. Since various cadres are designed differently the relative pay progression also varies. The Commission believes that any new entrant to a service would wish to be able to make a reasonable and informed assessment of how his/her career path would traverse and how the emoluments will progress alongside. The new pay structure has been devised in the form of a pay matrix to provide complete transparency regarding pay progression. 5.1.17 The Commission has designed the new pay matrix keeping in view the vast opportunities that have opened up outside government over the last three decades, generating greater competition for human resources and the need to attract and retain the best available talent in government services. The nomenclature being used in the new pay matrix assigns levels in place of erstwhile grade pay and Table 3 below brings out the new dispensation for various grades pay pertaining to Civil, Defence and MNS. 5.1.18 Prior to VI CPC, there were Pay Scales. The VI CPC had recommended running Pay Bands with Grade Pay as status determiner. The Seventh CPC is recommending a Pay matrix with distinct Pay Levels. The Level would henceforth be the status determiner. ^ In the existing system no entry pay has been prescribed at thelevel of GP 5400 (PB-2). Therefore a logical figure has beeninterpolated here based on the fitment table issued by Government of India post VI CPC recommendations. 5.1.20 While a carefully calibrated gradation has been adopted as the levels progress upwards, it would be seen that two levels, corresponding to GP 8700 and GP 10000 witness a slight departure. i. In the existing system there is a disproportionate increase in entry pay at the level pertaining to GP 8700. To address this, the proposed increase at this level has been moderated. ii. In so far as GP 10000 is concerned, this represents the Senior Administrative Grade, which carries a significantly higher degree of responsibility and accountability. Further, the levels of SAG and above are those which are involved in policy formulation. iii. Hence, in recognition of the same, the entry pay pertaining to GP 10000 as well as that of HAG and HAG+ has been enhanced by a multiple of 2.72.
iv. The Apex pay of Secretary/equivalent and pay of Cabinet Secretary/equivalent has been fixed by applying indices of 2.81 and 2.78 respectively. The rationalised entry pay so arrived has been used in devising the new pay matrix. 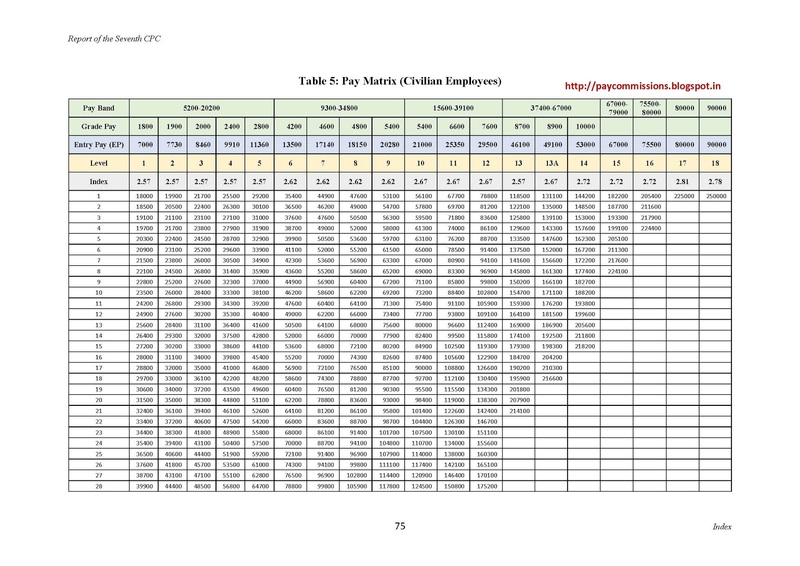 5.1.21 The pay matrix comprises two dimensions. It has a “horizontal range” in which each level corresponds to a ‘functional role in the hierarchy’ and has been assigned the numbers 1, 2, and 3 and so on till 18. The “vertical range” for each level denotes ‘pay progression’ within that level. These indicate the steps of annual financial progression of three percent within each level. The starting point of the matrix is the minimum pay which has been arrived based on 15th ILC norms or the Aykroyd formula. This has already been explained in Chapter 4.2. 5.1.22 On recruitment, an employee joins at a particular level and progresses within the level as per the vertical range. The movement is usually on an annual basis, based on annual increments till the time of their next promotion. 5.1.23 When the employee receives a promotion or a non-functional financial upgrade, he/she progresses one level ahead on the horizontal range. 5.1.24 The pay matrix will help chart out the likely path of pay progression along the career ladder of any employee. For example, it can be clearly made out that an employee who does not have any promotional prospects in his cadre will be able to traverse through at least three levels solely by means of assured financial progression or MACP, assuming a career span of 30 years or more. 5.1.26 The JCM-Staff Side, in their memorandum, have proposed that the minimum salary, at the lowest level, should be determined using a need based approach. They have proposed that the minimum wage for a single worker be based on the norms set by the 15th Indian Labour Conference, with certain additions to the same. The minimum pay as suggested in the memorandum is ₹26,000, which is around 3.7 times the existing minimum salary of ₹7,000. While the broad approach is similar, the specifics do vary and the Commission has, based on need-based minimum wage for a single worker with family as defined in the Aykroyd formula, computed the minimum pay at ₹18,000. Details on the computation of minimum pay have been brought out in Chapter 4.2. 5.1.27 The starting point for the first level of the matrix has been set at ₹18,000. This corresponds to the starting pay of ₹7,000, which is the beginning of PB-1 viz., ₹5,200 + GP 1800, which prevailed on 01.01.2006, the date of implementation of the VI CPC recommendations. Hence the starting point now proposed is 2.57 times of what was prevailing on 01.01.2006. This fitment factor of 2.57 is being proposed to be applied uniformly for all employees. It includes a factor of 2.25 on account of DA neutralisation, assuming that the rate of Dearness Allowance would be 125 percent at the time of implementation of the new pay. Accordingly, the actual raise/fitment being recommended is 14.29 percent. 5.1.31 The Commission has received numerous representations on the issue of fixation of entry pay for direct recruits at a level higher than those promoted into the same level from below. In the existing system, the entry pay for new or direct recruits takes into consideration the weightage given to qualifying service prescribed by DoPT, whereas for those reaching the grade through promotion from lower grade, the entry pay is fixed at the minimum of the pay band plus grade pay corresponding to the new grade. The entry pay therefore varies, and is different for those entering a level directly and those getting promoted into it. There have been demands for a uniform entry pay for all. 5.1.32 In the new pay matrix, it is proposed that direct recruits start at the minimum pay corresponding to the level to which recruitment is made, which will be the first cell of each level. For example a person entering service as a direct recruit at level 3 will get a pay of ₹21,700, at level 8 of ₹47,600, at level 10 of ₹56,100 and so on. 5.1.34 In case of a direct recruit to level L4 the entry pay will be fixed at the start of the level L4 i.e., at ₹25,500. 5.1.35 To take another example, if a person drawing Basic Pay of, say, ₹40,400 in level L5 is promoted to L7, the steps to arriving at his pay on promotion will be to first add one increment within level L5 to arrive at ₹41,600, and then fix the pay at ₹44,900 in level L7 as ₹44,900 is the nearest, next higher figure to ₹41,600 in the column of figures for level L7. 5.1.36 Although the rationalisation has been done with utmost care to ensure minimum bunching at most levels, however if situation does arise whenever more than two stages are bunched together, one additional increment equal to 3 percent may be given for every two stages bunched, and pay fixed in the subsequent cell in the pay matrix. 5.1.37 For instance, if two persons drawing pay of ₹53,000 and ₹54,590 in the GP 10000 are to be fitted in the new pay matrix, the person drawing pay of ₹53,000 on multiplication by a factor of 2.57 will expect a pay corresponding to ₹1,36,210 and the person drawing pay of ₹54,590 on multiplication by a factor of 2.57 will expect a pay corresponding to ₹1,40,296. Revised pay of both should ideally be fixed in the first cell of level 15 in the pay of ₹1,44,200 but to avoid bunching the person drawing pay of ₹54,590 will get fixed in second cell of level 15 in the pay of ₹1,48,500. 5.1.38 The rate of annual increment is being retained at 3 percent. 5.1.39 In the true spirit of having open ended pay scales the span of levels 1 to 11 has been kept at 40 years. This has been done to ensure that no stagnation takes place. However, level 12 and beyond, the span of successive levels has been reduced so that the maximum at each level is lower than the maximum pay at the subsequent level. This has been done as a result of capping of maximum pay at HAG+ (level 16) at a lower stage as compared to the Apex pay at level 17. Since Apex pay at level 17 is fixed at ₹2,25,000, a person residing in the previous level (level 16) should not draw equivalent or more than the apex pay, the maximum pay has been restricted to ₹2,24,400. Similarly the process has been followed until level 11 keeping in mind the maximum pay drawn by the person in the next higher level. Accordingly, the span of levels beyond level 11 progressively reduces from 39 years at level 11 to 4 years at level 16. It is important to note that the end-points of any column do not signify the end points of any traditional pay scale. Hence in any kind of calculation which attempts to work with the “maximum pay of a particular pay scale” it would be inappropriate, even incorrect, to pick the last figure of the column to be so. As has been stated earlier in this paragraph the column spans have been kept at 40 to cater to persons who may enter a particular level at any stage and may have resided in the level for a fair length of time. The end-points of the column, representing the possible highest and lowest pay in that level, may not be treated as the maximum and minimum of any closed pay scale, as used to prevail prior to the implementation of the VI CPC. 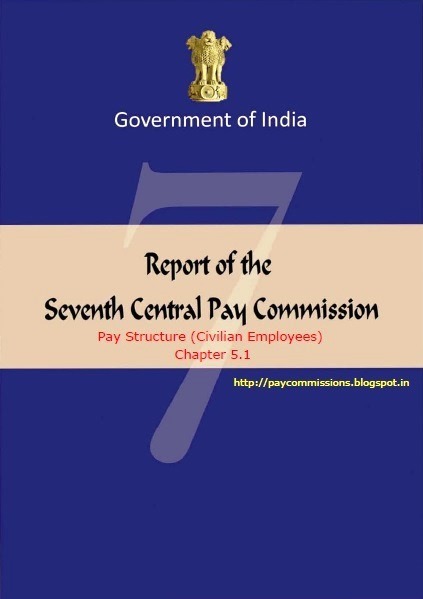 5.1.40 This Commission has felt that comparison of entry pay of the lowest functionary in the government with the highest pay drawn by the Secretary to Government of India is not appropriate. The comparison should be like to like while calculating the compression ratio. Accordingly, the lowest pay at entry level of Group `C’ should be compared with the entry pay of Group `A’ to arrive at the compression ratio. This Commission has recommended a minimum pay of ₹18,000 at entry level in Group `C’ and ₹56,100 as entry pay at Group `A’ level. The compression ratio is thus arrived at 1: 3.12 which signifies that a Group `A’ officer entering the government on direct recruitment basis gets roughly three times the pay drawn by a Group `C’ level functionary at their entry level. 5.1.41 Similarly comparisons can be made between maximum pay (₹56,800) of any employee who has joined in level 1 and rendered 35 years of service and received pay progression solely by way of MACP with the maximum pay of ₹2,25,000 drawn by Group `A’ officer at Apex level (level 17), the compression ratio works out to be 1:3.96. Since the maximum pay drawn for different officials will depend on their age of entry, promotional prospects in their services/cadres and individual performance, the minimum pay at entry level is considered a better comparator. 5.1.42 The various associations of the JCM-Staff Side have demanded that the recommendations of this Commission should be implemented w.e.f. 01.01.2014. Their argument is that there has been substantial erosion in the value of wages owing to non-merger of DA, which has crossed the 100 percent mark in January 2014. They have also demanded wage revision after every five years, instead of the present decennial exercise. 5.1.43 However, it is to be noted that this Commission was constituted in year 2014, well before the completion of ten years since the implementation of the VI CPC recommendations, which were made effective on 01.01.2006. As a result, its recommendations would be available for consideration before the ten year period gets over on 01.01.2016. The Commission does not agree with the demand of early implementation of revised pay structure and recommends that the date of effect should be 01.01.2016. 5.1.44 Although a number of demands were received for increasing the frequency of MACP as well as to enhance the financial benefit accruing out of it, this Commission feels that the inherent issues in the existing pay structure owing to which there was widespread resentment have been set right by way of rationalisation of pay levels, abolition of pay band and grade pay and introduction of a matrix based open pay structure. Hence, there is no justification for increasing the frequency of MACP and it will continue to be administered at 10, 20 and 30 years as before. In the new Pay matrix, the employees will move to the immediate next level in the hierarchy. Fixation of pay will follow the same principle as that for a regular promotion in the pay matrix. MACP will continue to be applicable to all employees up to HAG level except members of Organised Group `A’ Services where initial promotions up to NFSG are time bound and hence assured. 5.1.45 There is, however, one significant aspect where this Commission feels that a change is required. This is with regard to the benchmark for performance appraisal for MACP as well as for regular promotion. The Commission recommends that this benchmark, in the interest of improving performance level, be enhanced from ‘Good’ to ‘Very Good.’ In addition, introduction of more stringent criteria such as clearing of departmental examinations or mandatory training before grant of MACP can also be considered by the government. 5.1.46 There is a widespread perception that increments as well as upward movement in the hierarchy happen as a matter of course. The perception is that grant of MACP, although subject to the employee attaining the laid down threshold of performance, is taken for granted. This Commission believes that employees who do not meet the laid down performance criterion should not be allowed to earn future annual increments. The Commission is therefore proposing withholding of annual increments in the case of those employees who are not able to meet the benchmark either for MACP or a regular promotion within the first 20 years of their service. This will act as a deterrent for complacent and inefficient employees. However, since this is not a penalty, the norms for penal action in disciplinary cases involving withholding increments will not be applicable in such cases. This will be treated as an “efficiency bar”. Additionally, for such employees there could be an option to leave service on similar terms and conditions as prescribed for voluntary retirement. a. The issues raised by various stakeholders in respect of the existing pay structure have been addressed by subsuming of grade pay and pay bands into one composite level. b. The correction of variable spacing between adjacent grade pay and pay bands by way of rationalisation has been effected. The disparity between PB-3 and PB-4 has been set right by the process of normalisation. This will also help address the demands for upgradation of grade pay received in the Commission solely on grounds of disparity between various pay bands. c. The fixation of revised pay has been greatly simplified in the new pay matrix and will not involve further calculations. The basic pay being drawn by any person on the date of implementation is to be multiplied by a factor of 2.57 and the figure so obtained will be matched for the closest figure in the level pertaining to his/her existing grade pay and fixed there. d. The issue of differential entry pay has been resolved. e. The employee can traverse both vertically within a level in the new pay matrix by way of annual progression, and horizontally across levels by way of MACP as well as on regular promotion. This will enable him/her to visualise the career path across levels and span of service. f. The new matrix will provide greater visibility and transparency with respect to actual pay drawn as compared to the earlier system of pay scales or pay bands. It will also depict the exact amount payable to a person in relation to number of years spent in service in each level. g. The new pay matrix is expected to be easy to administer. h. In line with the principle of greater transparency, the new pay matrix will provide an unambiguous and complete view of the pay system in the Government of India. i. The pay matrix can be gainfully analysed to provide crucial data on trends in pay progression, number of personnel populating each level, number of personnel entering and retiring at various levels, promotional trends of various cadres, financial outgo at various levels, and so on. Hence, it can act as a powerful tool to bring in financial management reforms. 5.1.48 Similar pay matrices have been designed for the personnel of defence forces and the MNS so as to ensure uniformity in pay structures. 5.1.49 The Commission, after its interaction with the authorities of Australia and New Zealand, feels that India should also have a permanent Remuneration Authority that should review the pay structure based on job roles evaluation, remuneration prevailing in the market for comparable job profiles, general working of the economy, etc. within a given budgetary outlay. With this, the pay structure could be revised periodically, at more regular intervals, say annually, without putting an undue burden on the public exchequer every ten years, as is the case now. Such a periodic review may have many possible fallouts: impact of revision of wages could be easily absorbed in each year’s budget and quicker remediation of anomalies would take place, leading to greater employee satisfaction. In the backdrop of annual revisions, the present system of biannual revision of DA could also be dispensed with. 1. She will first be given one increment in her current Level 4 (to Rs.29,600 in this case).